Well, I've told you why we've chosen Ponte de Lima. Now let me show you the land we plan to build on. Our plot is just beyond the white house. The land behind is hillside covered in gorse and broom. Below is not accessible by road and therefore cannot receive planning permission. There's a big olive tree on the land, which we'd like to keep. 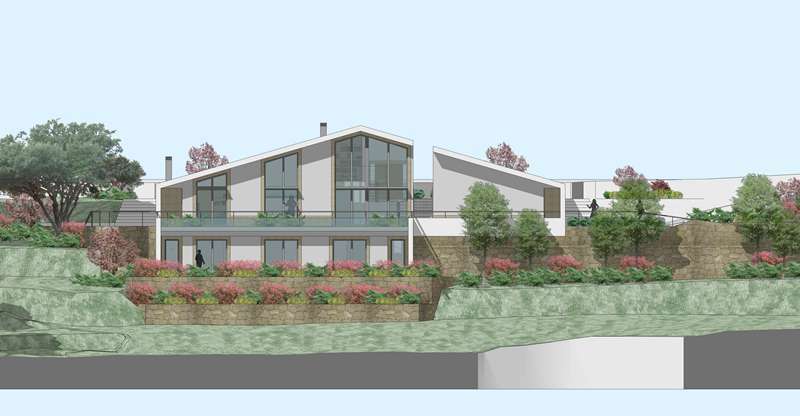 Our architect says that it will almost certainly have to be moved but luckily a landscape designer he knows thinks that, with care, it should be possible to relocate it. Let's hope so. The reason we have chosen this plot is the view, which is spectacular. In this composite picture, it is very hazy. Next time we go to see it, hopefully with the architect's plans in hand, I'll take some more snaps. Getting up in the morning and breakfasting on the terrace with this view before me will be the fulfilment of a long-held dream. The house is going to make use of the terraces and so the upper part will stand further back than the lower one. 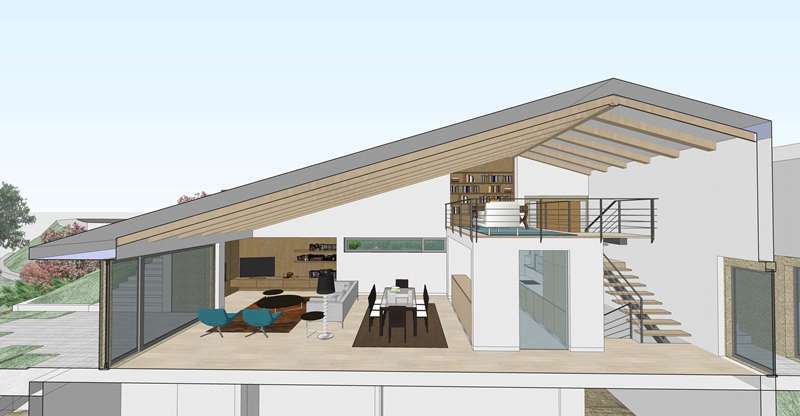 This is the architect's drawing. Without the houses around to give an idea of scale, it gives the impression of being huge though it has, in fact, only three bedrooms. It is to be an 'upside down' house with the living room above the bedrooms. Instead of going up to bed we will go down. We will be able to walk out of the living room onto a terrace which will in fact be the roof of the bedrooms. The blank section to the right will be the garage. Buying and selling property through estate agents is still a fairly new way of doing business in Portugal. Twenty years ago agencies hardly existed. Property seemed mostly to be handed down within the family or business carried out through mutual acquaintances. This led to a number of inexperienced foreigners taking up the selling of property and some dubious deals being done with locals, followed by court cases. (It is essential to establish who the owners are - because of Portuguese inheritance laws there may be many - and that they all agree to sell). Now the business has been regulated and agents must be qualified. There are a number of local, national and international agencies though, as elsewhere, buying property can still be a stressful experience. Building too can be fraught with problems. For a long time we were concerned about finding a good architect. One invited us to see his new home but it took us a long time to find it. We hadn't realised that the shipping container on a piece of churned up field was the top story of house which stretched down a slope. However much insulation he used, in a place where temperatures can reach 40oC, cladding a house in metal seemed crazy to us – you could burn yourself touching it in summer! Besides that, he told us that he would only build the sort of house he liked, mentioning Frank Lloyd Wright's innovative house in Pennsylvania, Fallingwater, which is built over a stream, as an example. The idea that he might build what we wanted seemed foreign to him (as was the idea that we might not be able to afford such high end inventiveness). Fortunately for us, a near neighbour, who has been building a new house too, introduced us to his architect, a young man whose character and presence impressed us, not to mention his delightful sense of humour. We have been working with him for some time now and have been pleased by his eagerness to interpret our ideas into a plan to suit us. This is his plan for the interior of the living area. We don't yet know who our builder will be though we do know who it won't be. Our neighbour's house is at least 9 months behind schedule as his builder decided there was more money to be made by going to France to work and left the house half built! Even though he eventually did come back and finish the first phase, we shall not be asking him for a quotation. We have seen the work of another and received a recommendation for a second from a Portuguese contact. After we have found a third, seen work done by all of them and received quotations, we'll decide. 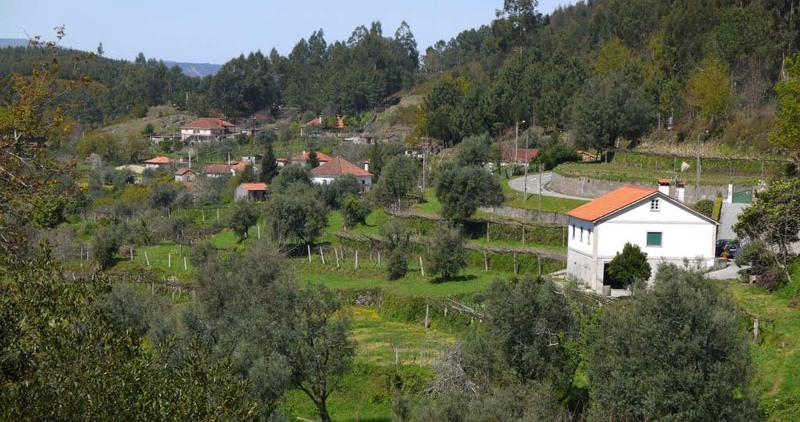 Before then, however, it must be submitted to the 'câmara municipal' – the town council - for approval. To read more about our architect, Bruno, keep coming back to the blog. I'll write about him another time. Has anyone out there built a house in Portugal and done it on time and on budget? Tell us your experience. Thank you so much for your kind words. It always gives me a boost when people tell me they've enjoyed my stories. I'll write to you privately about suggestions for places to investigate. Of course the best thing, if you can afford it, would be to come and check places out by driving around and seeing which part of the country you like best. The countryside and climate are diverse, hilly, green and rainy in the north; hot and dry in the semi-desert, rolling lands in the Alentejo and so on. Let's correspond and you can tell me what you like apart from the ocean. I look forward to a happy exchange of ideas. I am enjoying reading your blog. I would love to visit this little town in the north and wonder if you might recommend a band or hotel. Is driving on your own difficult or are their busses and trains between towns in the north? Is it hard to get a train to Porto or down to Lisbon? I speak some Portuguese and think I could navigate the language better than the roads! I'm glad you like the blog. Thank you for telling me. While the house is being built i have often stayed at a B&B right in the centre of Ponte de Lima. It's called the Mercearia da Vila and you'll find it in the main avenue right by the church. It's simple, very clean, has comfortable beds and the owner and staff are really friendly. The breakfast is good too. I'm not sure how you're getting to Portugal but if you are arriving at Porto Airport it's easy to drive up to Ponte de Lima on the IC 28 or the A3. Both are toll roads but there is relatively little traffic on them. You should be able to park either on the Avenida Antonio Feijo (I think I've got the name right) or on the sand down by the river. There is a bus from the airport but it tends not to run at the times you want. There is a train from Sao Bento in Porto up to Viana do Castelo but I don't know about buses from there to P de L as we always drive. Trains from Porto to Lisbon are good. Good luck making it to Ponte de Lima. I hope you will like it as much as I do. Why don’t you sign up for the newsletter? Then you’ll know when I post a new article.